Occurrence: The website http://www.allergyinschools.co.uk suggests surimi (a seafood product present in some processed foods), Caesar salad dressing, Worcestershire sauce and Caponata (all of which are likely to contain anchovies), and kedgeree (a rice and fish dish) as hidden fish allergens. This entry is simply designed to list and survey the available entries on allergy to fin fish. 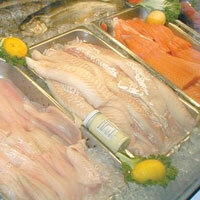 The entries currently available are Alaska pollock (or pollack), carp, cod, mackerel, salmon and tuna. These are not the only fish mentioned in the literature on food allergy as some articles have used up to 17 species of fish but are those for which there is molecular data on the allergens. In general, fish allergy involves beta-parvalbumins as the main allergens. Thus there is extensive cross-reaction and the entries are rather similar. Tuna is slightly different from the other entries as it seems to have a lower parvalbumin content and is also often eaten after canning. Fish roe or caviar is allergenically different from fish muscle and also may show cross-reactions between different species. No entry has yet been written on fish roe but some data is included in the entry for salmon. At least one article has described allergy to dogfish and it is possible that allergy to cartilaginous fishes (elasmobranchs i.e. dogfish, sharks, skates and rays) shows differences from allergy to the bony fish listed above.